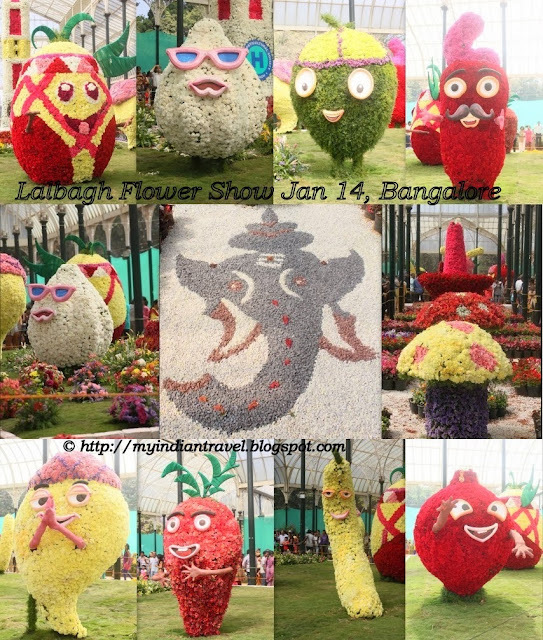 Every year in the month of January and August, the Lalbagh Gardens at Bangalore hosts Flower Show. If in Bangalore around this time one should not miss the event. In the month of January, it is usually organized for 10 days from January 17th to 26th. The theme for this year is to show respect to all the martyrs and freedom fighters of our country. One of the prime attraction among others is majestic floral tower. The colorful bunny was very cute with her cart of fruits and vegetables. On display were around 100 varieties of Orchids, Pansea and among others. Cute floral replicas of veggies and fruits are on display in the Glass House of Lal Bagh. Every day thousands people enjoy the beauty of these flowers on display. It is mostly crowded in the evening on the weekdays. Best time to be in this place is the early afternoon. I had been here on the weekend afternoon. Even though it was crowded I had enough space to take some snaps. not just amazing...very very creative. What a lovely flower show. The displays are beautiful. Thank you for sharing your visit. A fun flower show, amazing what can be made with flowers! That is awesome - it reminds me of the Keukenhof from when I grew up in Holland. I missed it this January. I feared to go there on a weekend considering the number of people who'd visit. The captures gives a peep into what we had on the show. Thanks for sharing. This brought back some beautiful childhood memories. I used to love going to lalbagh during the flower show every year. Lovely pics . Heard its great.Now seen the beautiful lovely flowers through your pictures.Never been dere ,may be next time. What fun! This post brought a smile to my face. Loved the bunny. Such beautiful colors and artistry! Nice clicks. Will visit next republic day. wow, what a treat to the senses. Those are amazing floral sculptures! Very colorful and cheerful, so creative! So beautiful photos, Thanks for sharing. Great shots of the flower creations. They are beautiful and fun. Incredibly beautiful creations. They remind me of our Rose Parade. Full of fantasy, I like this beautiful sculpture garden with flowers, funny pictures! I would love to see this flower show...how creative. Love your shots! Some funny and some fascinating flower displays! How beautiful and what funny shapes ! This is truly a feast to the eyes. Happy ABC Wednesday! I loved the tower. Beautiful , colourful and unique. What a lot of hours has gone into making those fantastic objects. I love the structure the garden show is in, so light and airy. Ah, so lovely! Love flower shows and festival. Around this time, we also have a flower festival here in the Philippines called Panagbenga Festival. How gorgeous this flower show looks, I am glad you managed to get there when it was quiet to take some photos to show us!